My child has 22q11.2 deletion syndrome. I am not one of those moms who did not know what to expect when my daughter was born. I already knew I had 22q11.2 deletion syndrome because when I was younger my half paternal sibling had a seizure one year after eating turkey at Christmas one time and they had to run a ton of test to what caused the seizure it was low calcim storage levels in the blood and that lead to a genetic test called a fish test. After his fish test result came back positive we thought it was only him who had 22q. Next came my half paternal sister she too had a seizure when she was small again the doctors tested her for cause of seizures and then after knowing that my half brother has 22q they tested my sister as well. Next on the testing list was my father they tested him because of the research that it is 50/50 chance of it being either passed on or a random deletion. After Bella was born she turned blue and started to have seizures. I had to get a rushed fish test my daughters doctor did not fully understand all of the risk and complications and she had to call infection diseases and all kinds of people and specialist to help us. I am forever grateful we were put on the right path. 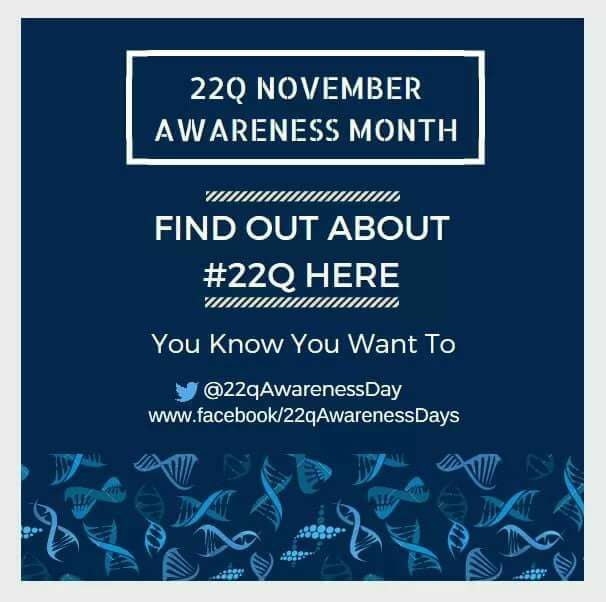 There are so many family's, adopted parents, foster parents and caregivers who have a child in their mist or adult and do not even know that that person or them have 22q. I was lucky to have Bella born in Michigan I had the test done and results came back within 3 days some people wait much longer or do not even get to be approved to have the test we had to stay longer in the hospital Bella spent time in the Nicu unit and I had to have a bit longer recovery time while we had to find ways to get Bella to be able to eat since I couldn't breast feed Bella had soft palate where she couldn't' latch it was suppose to be the happy moment in my life but it was filled with scary moments and some of which I blocked out of my memory I mean the fainting part I didn't realize until a few years ago how close I was to not making a full recovery. My body has not fully bounced back and I struggle now with gasteroparises and back problems. Any how that is how we started our journey to 22q. That's the beginners guide to 22q. After 10 years I have not only lived with 22q with the mild symptoms and how it effects me but raising my child who has 22q but her major issues is with cerebral palsy and my major issues is with gasteroparies. There you have it the beginners guide to 22q how to get tested, what test you need to take and the next step is finding a doctor who understands and knows how to treat the low calcium levels and blue baby symptoms if you can find a doctor who is caring and listens like we had been lucky enough to have had then that is the trick to living with 22q. Knowledge is key and hope! Doctors learning about this is the key to all of this. 22q can cause heart defects my daughter had extra blood pumping in her lower left chamber but it resolved after she was born she was discharged from the heart doctor with just a mild heart murmur. Poor immune system but we lucked out and our immune is strong it is only our body internal core temp that struggles to regulate when we are sick but we are fine other then that we can have live vaccines we have been tested to make sure we could. palate anomalies between the low calcium and the low iron Bella and I both have which is treatable with medications we are doing well. Low levels of calcium in the blood storage level in the blood total calcium can read normal but the other calcium can be low and that treatable with calcitrio a life line for our family. When we got the diagosnes of 22q is when we met with a ton of different doctors that is why I want to share this post while meeting with a lot of different doctors specialist even heart doctors some did not know what 22q was or what digeorge syndrome was it was shocking and frustrating trying to explain in laymens terms to a doctor in doctor terms. Early diagnoses and effective treatment of each symptom that pops up is the key to having a better quality of life. If neglected or ignored out comes can be deadly. Early interventions is the key to why Bella and I are thriving as much as we are. There are some cases where there is no cure for the symptoms that show up like in my brothers case who passed away but there is hope if more doctors become aware they can share this info with the people who come to them for help either as children teens or adults. I challenge you to share this post with 22 doctors not just doctors who are in the field of 22q treatments spread this post out side of the 22q community the old fashion grass roots word of mouth with out any fluffy fundraising events but just simply say hey you do you know what 22q is and wait for their reply and ask them if they know what 22q is and if they know how to treat a child or adult who walks into their office. That's the biggest hurdle is to get doctors to know what 22q11.2 deletion is and digeorge syndrome is called and all of the very different veriations of it that can happen based on where the location of the deletion is.